With apologies to those who identify as “Capricorns”, the zodiac constellation that is approaching the evening meridian these days is an awfully strange one. Whereas most of our zodiac symbols are animals (Lion, Ram, Scorpion, Fish) or people (Virgin, Water Bearer), and even one inanimate object (Scales) – Capricornus is a… Sea-Goat? Which is…??? The Archer (Sagittarius) is a similar hybrid, as a centaur, but that one at least is popular enough in mythology to have a place in modern awareness. Enki as Aquarius, from the Adda Seal in the British Museum, circa 2300 BC. Note the goat at his feet and the fish in the water pouring from his shoulders. Does this suggest Aquarius is originally Enki, with the sea-goat Capricorn at his feet? 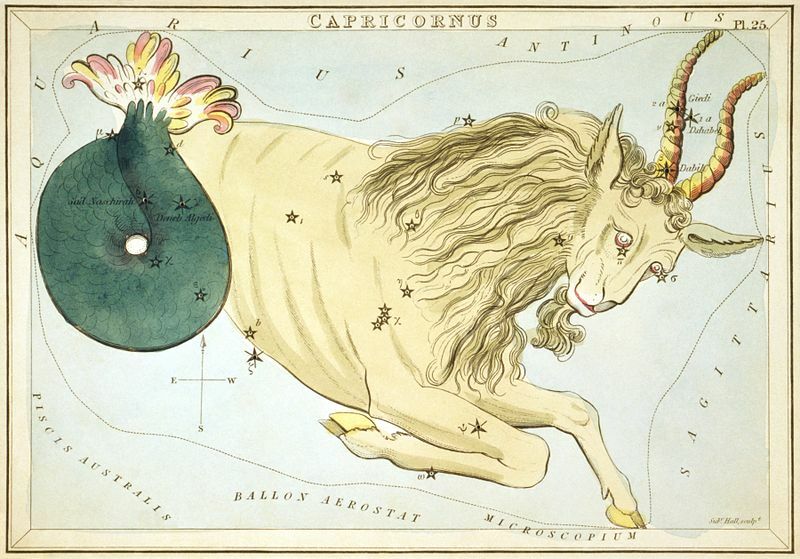 Capricornus is depicted as a creature with the head and front legs of a goat, and the tail of a fish. Its origins aren’t 100% clear, but this constellation is likely ancient. It seems to be associated with Enki, a Sumerian god of wisdom, creativity, fertility and water. He is depicted as the creator god of ancient Sumer, and often with water pouring from his shoulders, or from a jug he carries (sound familiar, Aquarius?). He was also associated with the symbols representing a goat, a fish, or sometimes a goat AND a fish, together. So it’s entirely possible that modern-day Aquarius is Enki in human form, and adjacent Capricornus (a much more obscure, dark constellation) is the symbolic counterpart to this same deity. Various stories also refer to Ea, or Oannes, which are Babylonian variants on Enki, and the gods responsbile for bringing wisdom and knowledge to mankind. Ea and Oannes are depicted as more fish-man, without the goat, and wearing fish-scale clothing, but he is derived from the same deity. I’m sure Babylonian scholars would disagree, but Enki, Ea, and Oannes are all essentially the same being. The Greeks already knew Capricornus was a goat-fish, but they have a different origin myth to explain what it is. In Greek lore, after the war between the Olympian gods and the Titans, a monster called Typhon sought revenge. The Olympians changed their forms temporarily, in order to evade Typhon. Pan (or Bacchus, the story changes) turned himself into a goat, but then determined this was an insufficient disguise, so he jumped into the Nile to hide… but only went in up to his waist. So… top half goat… bottom half turned to fish… but it was really Pan/Bacchus all along. Seems like a fairly convoluted backstory to explain this thing that even THEY thought was pretty strange. Position and primary stars of Capricornus, ~9pm in late August, with Teapot of Sagittarius as reference. From Stellarium. Strange creatures aside for a moment, Capricornus is a pretty dark, obscure constellation (second only to Cancer in terms of dark zodiac constellations). It resembles a slightly folded triangle, best found by starting with the teapot of Sagittarius and panning east. About 2,000 years ago, Capricornus was the southernmost zodiac sign. The ecliptic passed through it at -23.5 degrees, south of the horizon, and the Sun was in Capricornus on the winter solstice. Even though precession of the equinoxes has made this no longer the case (these days it’s in Sagittarius), we still refer to this latitude of the Sun’s southernmost movement as the “Tropic of Capricorn”. The solstice also marked the beginning of the year in Babylonian culture – making the Sea-Goat a pretty important constellation, despite is relative dimness, and perhaps worthy of honoring with the symbolic image of the creator-god. All this makes some sense – the echoes of ancient history are still present in our astronomical lexicon today, even if we don’t really understand – definitively – what this creature is and what he represents. It’s a good reminder that stargazing, and looking for meaning in the heavens, is as old as mankind itself, and we are only the latest in a long line of human beings who look up in wonder. Hey, leave us sea-goats alone! We may belong to a pretty faint and ridiculous constellation, but we try harder.